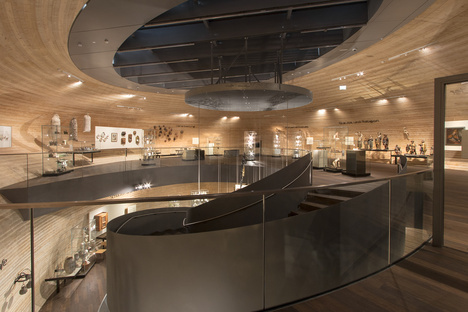 PANEUM - Wunderkammer des Brotes, an information centre and event forum in Asten, Austria, is a concrete and timber pavilion about the history of bread. 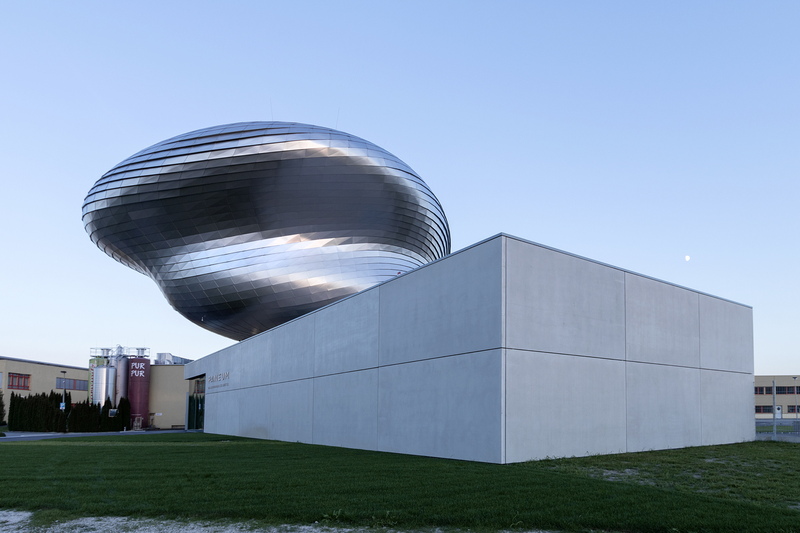 Designed by Wolf D. Prix’s COOP HIMMELB(L)AU, it is a freestanding structure in which an organic shape contrasts with a minimalist base. 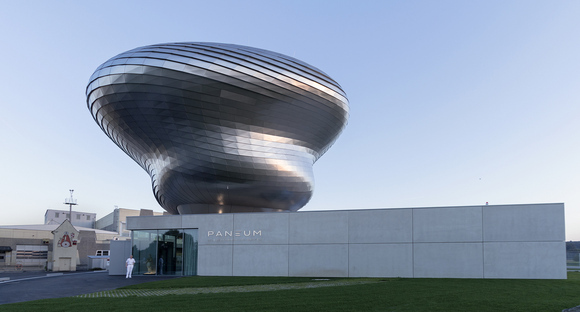 It was Peter Augendopler in person, in charge of Backaldrin Österreich The Kornspitz, who asked Wolf D. Prix of COOP HIMMELB(L)AU to design the PANEUM in Asten, Austria, a little museum about bread and the new symbol of the company. Austrian studio COOP HIMMELB(L)AU uses the PANEUM – Wunderkammer des Brotes to experiment with its architectural concepts and amaze the public once again. 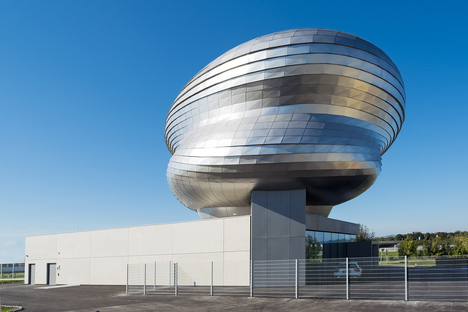 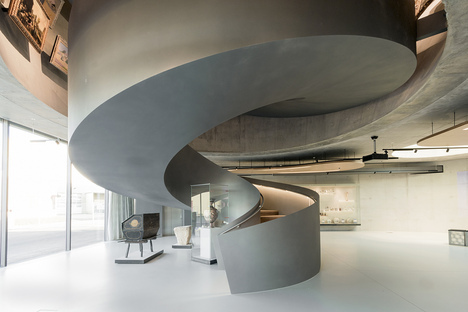 Located in the headquarters of Backaldrin Österreich The Kornspitz Company GmbH on the outskirts of Asten, beyond the Westautobahn, PANEUM welcomes visitors with its 3D shape designed by computer with numerical control. 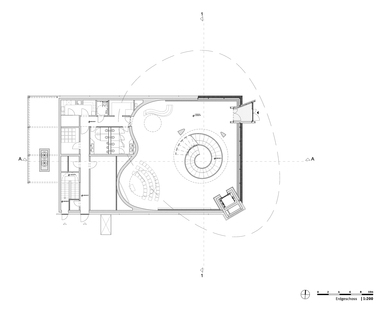 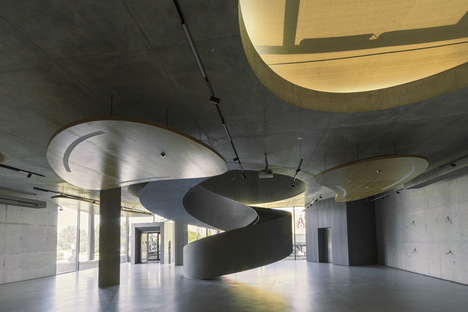 Its inward-looking shapes and daring forms contrast with the rural landscape. 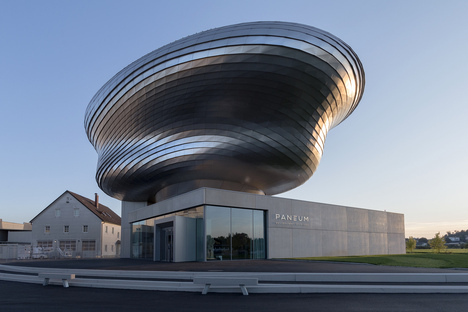 This structure devoid of right angles has no main façade but encourages visitors to contemplate it from all angles, and towers over the other buildings in the industrial complex, reminding some people of a loaf of bread, others of a face. According to Wolf D. Prix, the construction has no specific formal references; its surfaces covered with stainless steel shingles, over which light slips without interruption, create chiaroscuro effects like that of the drapery in Renaissance frescos, so that the impression it leaves behind is one of continual search for motion. 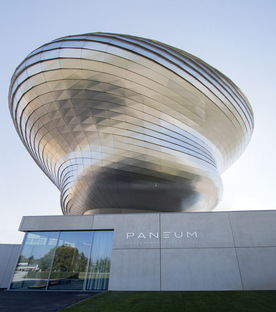 The architectural volume is made up of two essential parts: the first is a minimalist base, a concrete and glass box cast on site containing the foyer of PANEUM and rooms for events for a maximum of 120 people, as well as toilets and technical facilities. 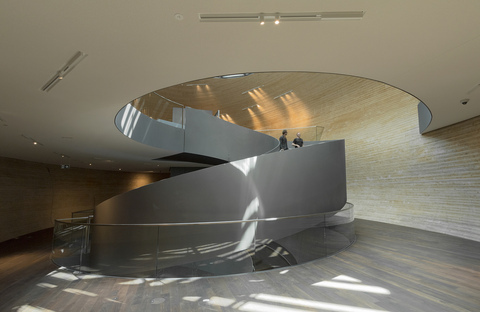 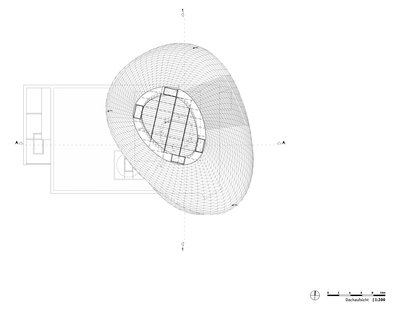 The second volume, sharply contrasting with the form of the first, is a hermetic metal wrapper inspired by the boldest modernity, containing a wooden heart which is the site of a sort of museum. 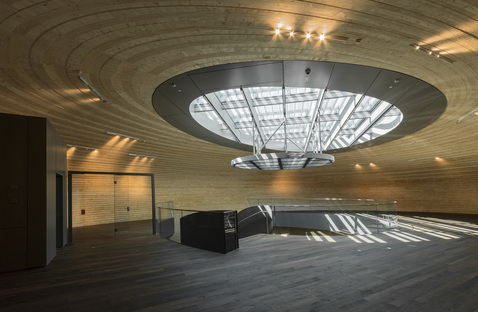 Visitors are amazed to see that this freestanding structure is not made of metal or cement, but is a self-supporting wooden wrapper: only curved glulam permits creation of such a free form, underlined by the steel shingles. 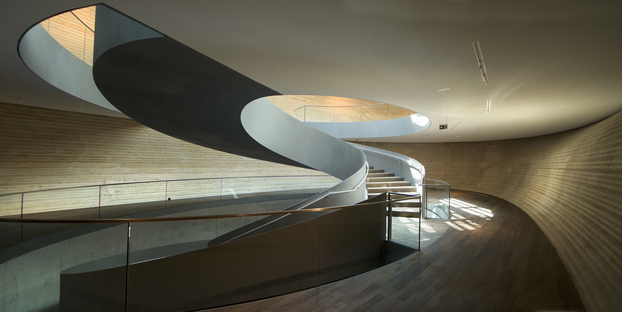 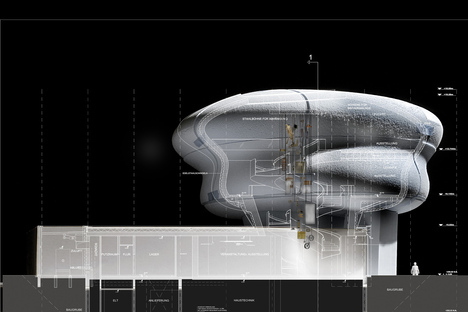 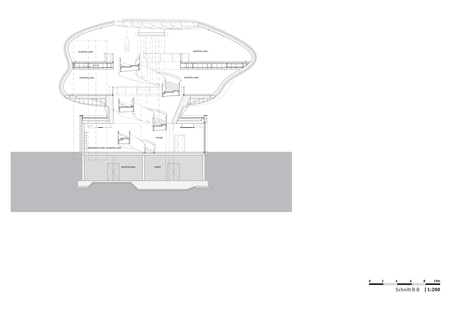 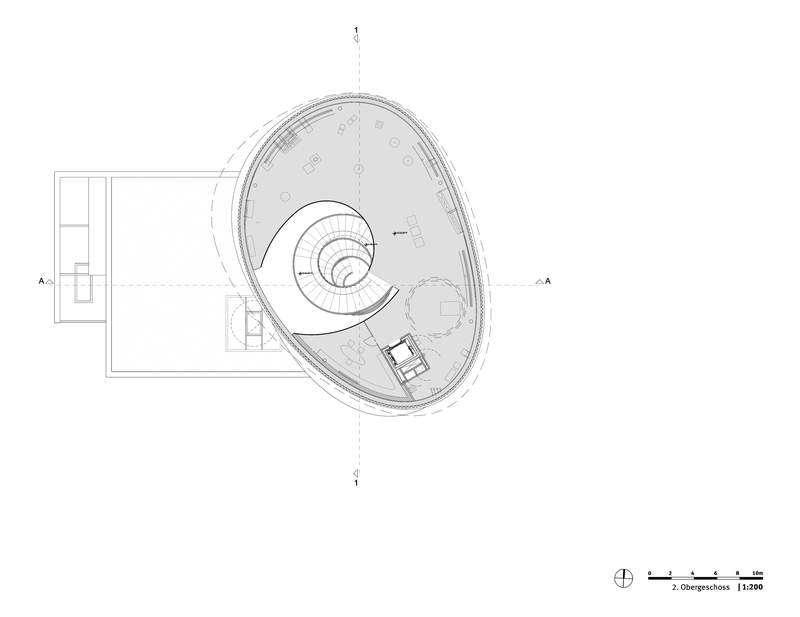 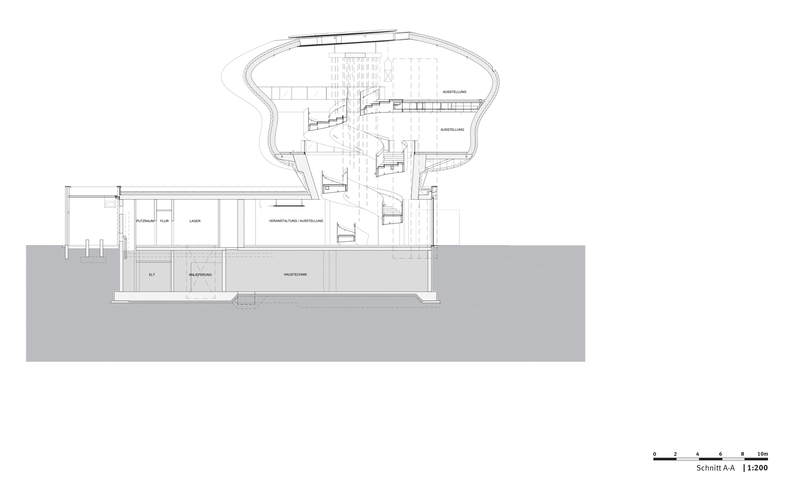 As we enter the “box” through its base, as Wolf D. Prix says, we find ourselves in a bare space where all our attention is focused on the big spiral staircase leading to the exhibition spaces on two levels, lit up by daylight from a big skylight at the top. 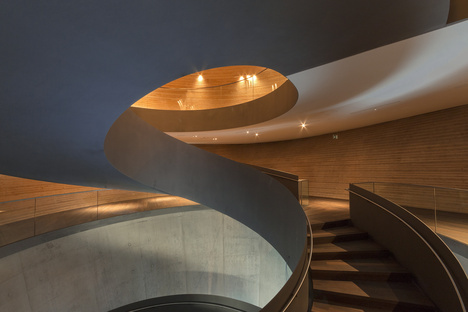 As we climb the staircase we find ourselves in an artificial space filled with a warm, cosy light, an irregular round space in which exhibition areas intersect. 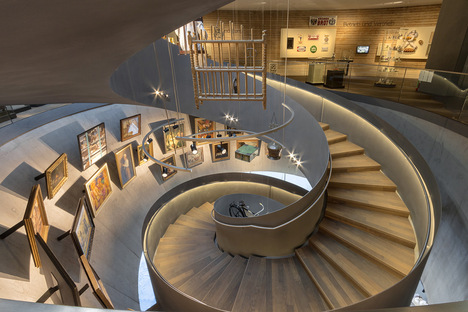 The complete absence of windows and therefore of connections with the world outside ensures that the visitor is totally immersed in what the architects call a wunderkammer of bread. 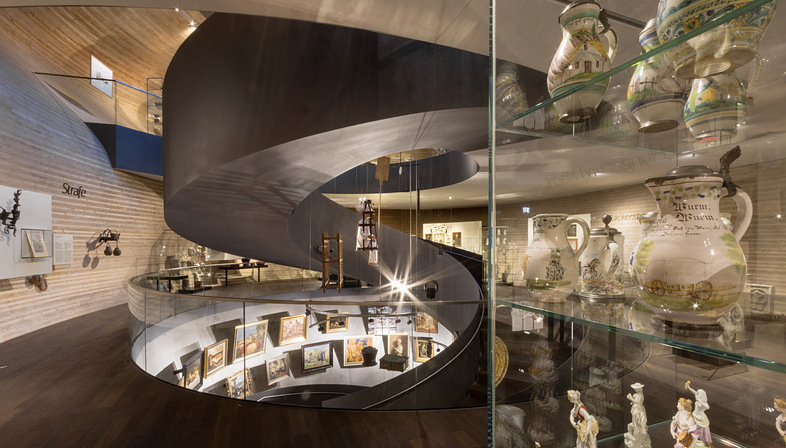 The continuous free form helps to convey the concept of the wundercammer, or chamber of marvels, a term used in the Baroque age to refer to an astounding collection of objects and implements centring around a single theme, a dizzying collection of inventions with instructional purposes. 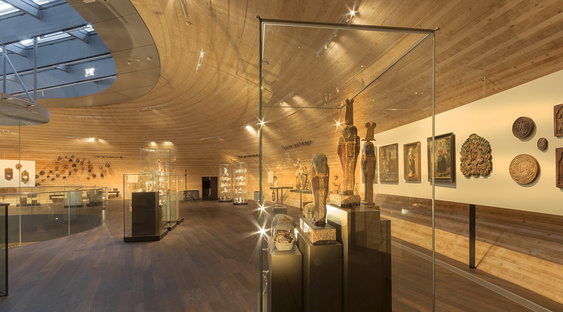 Here the theme is bread, in all the forms in which it has been expressed over centuries of history and art. 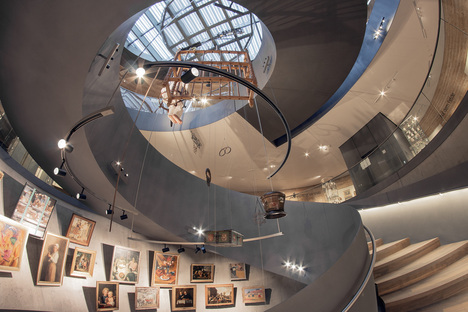 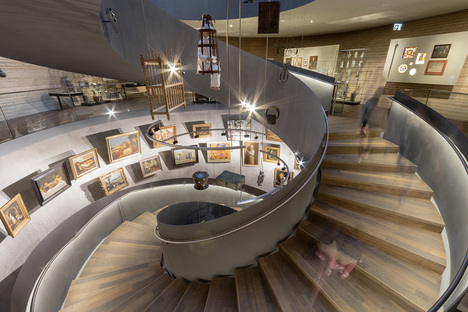 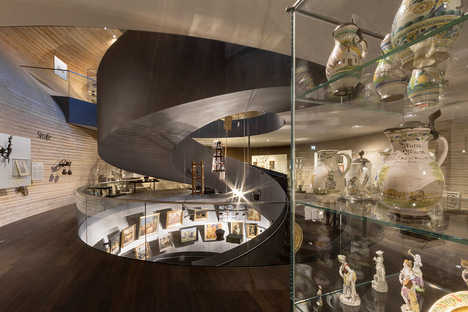 Sculptures, paintings, curious objects displayed in a dizzying vortex of wood, in which, as the PANEUM demonstrates, there are no predefined exhibition routes, but a free, personal experience of learning.